Cattaneo Commercial have just achieved a letting of Thameside House, Hurst Road, East Molesey, Hampton Court KT8 9AY at a new record rent for the area. 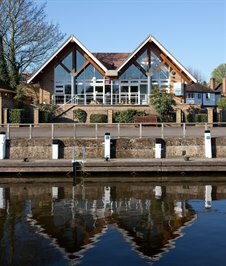 This striking self contained office building is situated on the banks of the River Thames diagonally opposite Henry VIII's Hampton Court Palace. The building comprises 3,400 sq ft of modern offices all on one floor with vaulted ceilings and direct views over the river with it's own terrace and car parking for 20 cars. The building has been let on a new 10 year lease to a capital management/investment group.